Dan Burstein’s “Secrets” series has more than three million books in print worldwide. Burstein is the founder of Millennium Technology Ventures, a New York-based venture capital firm that invests in innovative new technology companies. 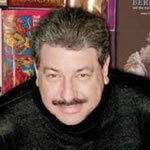 He is an award-winning journalist and author of six prior books on global economics and technology, including Yen!, Euroquake, Road Warriors, and Big Dragon. He is also the co-author of Blog! How the Newest Media Revolution is Changing Politics, Business and Culture.